Living hinges are a type of hinge made from an extension of the parent material (typically polypropylene plastic). They are the thin section of plastic that acts as a connection between two larger plastic sections. Typically the larger plastic pieces and the living hinge "bridge" will be made of one continuous piece of plastic. Since it is very thin and typically made from flexible polypropylene, the living hinge is also able to rotate about one axis 180 degrees or more - potentially for millions of cycles without breaking. Contrary to most hinges which involve multiple parts assembled in a traditional mechanism, living hinges are not a separate entity. They can be described as a purposeful fault line at a predetermined point in the material which is carefully designed such that it doesn’t fail after repeated bending. 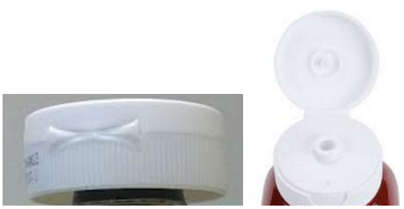 The bottle cap on a ketchup bottle is perhaps the most well known example of a living hinge. How Are Living Hinges Created? Living hinges must be designed, prototyped and then manufactured. Design is done using computer aided design (CAD) software like Solidworks while prototyping is done using one of two major methodologies: CNC machining (a subtractive process) or injection molding. It’s important to note that not just anybody can CNC machine a living hinge prototype. In fact, to our knowledge Creative Mechanisms is the only shop that has this unique capability. 3D printing (additive manufacturing) is a third way to prototype living hinges but it presently has some quality limitations not inherent to CNC and injection molding (more on this below). Mass manufacturing is done exclusively using injection molding. The first stage of living hinge production is computer aided design (CAD). Major design considerations include the desired hinge action, the size of the hinge, and the desired range of motion. See the section below for some examples of different living hinge designs. Short Continuous Straight Hinge: This hinge also involves two plastic “stops” that act to arrest rotation at 180 degrees. This is also called a triple hinge as there are three unique pieces of plastic acting as a living hinge about the same axis. Butterfly hinges are a classic hinge type that goes back to their origins in 17th century cabinetry. A butterfly hinge is used when you are looking for a "bi-stable" lid action. Being bi-stable, the lid will want to snap to either the open or closed position, and will not stay in-between. The webs on the side of the butterfly hinge stretch, acting like a spring that pulls the lid to either the open or closed position. They can also be made into a living hinge with the primary purpose being to allow a certain range of motion while disallowing others. This unique design by Creative Mechanisms is a dual-action hinge designed to prevent children from opening a container or lid. There is a living hinge designed into the mechanism but other features in the cap make it child resistant. You can see how it works in the video below. This is simply the use of multiple hinges in the same place (whether the number be two, three, or even more). The hinge below was shown previously as a straight hinge (due to the plastic section in the middle of the hinge) but it is also a triple hinge. As you can see there are three unique plastic living hinges working in tandem. Generally speaking the best way to produce a novel product with a living hinge is to design the mechanism, CNC machine an initial working prototype out of the final production material (polypropylene), and then, once the design has been finalized, to develop an injection mold tool to produce the polypropylene part in volume using injection molding. CNC is by far the best way to produce a single prototype product with a living hinge. If you are trying to generate a proof of concept or up to 10 prototypes then CNC is likely the best way to go. Many people believe that it’s not possible to CNC a living hinge but they’re wrong. Everyone has always told us just to forget it ... “you can't machine polypropylene,” they say. But it turns out they’re all wrong. It can be done. And we can do it. Our talented team at Creative Mechanisms has solved the problem. They can machine polypropylene cleanly and with great detail. They can machine snaps that are functional. They can machine the formerly impossible living hinge prototype down to .005 of an inch. The results are amazing. Not only can it be done, it’s by far the cheapest and highest quality way to produce a working prototype model for a new living hinge design. Read more about the CNC prototype production process for living hinges here. For design verifications and prototyping, using a CNC machine to cut your living hinge prototype is likely to be the best choice. This is because you do not have to go to the trouble and expense of designing a mold. Getting the hinge right with a mold can be a tricky process and you’re going to invest significantly more money to do it. Injection molding is by far the cheapest way to produce parts with living hinges in high volume. If you already have a finalized design and have produced a working prototype you are happy with in the final production material (polypropylene) then you are ready to look into injection molding. For sale samples where a couple of hundred prototypes are required, using injection molding is likely to be the better option, not only because of the quick turnaround but also because the finish is better than a CNC cut prototype and this is vital in sale sampling as it is desirable that the prototype looks as close to the final product as possible. Producing the tooling for a mold tool is generally very expensive. You will benefit by working with an experienced design team that can translate part designs in CAD into a mold that can in turn produce the desired parts without injection molding defects. For example, choosing where to locate the gate or how many gates to have is a very delicate process. Some trial and error works for most people but for the experienced designers, factors such as the design of the prototype itself or where the living hinge is located on it are considered. There are two common problems encountered when choosing where to place the gate or gates. First is when the gate is close to where the hinge would be located, squeezing plastic through there to the rest of the mold produces an excellent hinge but causes sink as the hinge is too small to ensure proper distribution of the plastic. Choosing to use two gates however, with the plastic flowing towards the middle where the living hinge is located will reduce the possibility of sink but may give rise to a faulty hinge and the possibility of cracking. Balancing the two extremes requires some judgment depending on the particulars of the given project. 3D printed living hinges are created by using a single drop of plastic in a vertical orientation. Certain plastics available for 3D printing can replicate the qualities of polypropylene but none of them currently available work quite as well. 3D printed living hinges tend to be brittle and fail when repeatedly bent. Normal living hinges made from polypropylene can be bent millions of times without showing significant wear and tear. CNC machining produces a prototype for approximately the same price as 3D printing without the degradation in quality. Another poor option to prototype living hinges involves creating a rubber mold and then casting a low-durometer urethane model. The problem, similar to 3D printed living hinge prototypes, is that you will end up bending the prototype hinge a few times and it will break. The product simply doesn’t stand up to normal wear and tear. The last thing you want to do is present your proof of concept and have it break on you. This is a very poor prototyping method compared to CNC. Screws: You can make a living hinge mechanism out of a thin piece of polypropylene plastic sheet stock and then screw it into place between the two sections of a living hinge part (the base and the cap). Tape: Believe it or not many people who don’t know the process to CNC living hinge prototypes end up unsuccessfully trying 3D printing and/or casting the prototype in low-durometer urethane only to end up disappointed with a broken prototype. The fall back option tends to be tape. This is simply unnecessary as CNC is a professional and cost-effective way to produce working prototypes. Living hinges are made almost exclusively from polypropylene plastic. Polypropylene is a very flexible, soft material with a relatively low melting point. These factors have prevented most people from being able to properly machine the material. It gums up. It doesn’t cut clean. It starts to melt from the heat of the CNC cutter. It typically needs to be scraped smooth to get anything close to a finished surface. Everyone has always told me just to forget it ... “you can't machine polypropylene,” they say. But it turns out they’re all wrong. It can be done. And we can do it. If you want to learn more about polypropylene read here. In some cases other plastics like polyethylene can substitute for polypropylene for the purposes of a living hinge. Also, Stratasys advertises living hinge prototype capability with 3D printing materials like “Rigur” or “Nylon 12.” The upside to 3D printing living hinges is that it can be done quickly and for a cheap cost. The downside to 3D printing in our experience is that the prototypes made from 3D printed materials tend to break much quicker than a traditional polypropylene living hinge. The problem with 3D printing a living hinge prototype is that a better prototype can be CNC machined from a solid block of polypropylene for the same small cost and the same quick turn around time with the added benefit that it is created in the same material (polypropylene) that a production living hinge will be made from. Accordingly, it will function as well as an injection molded living hinge (i.e. it will bend millions of times without significant wear and tear). This makes 3D printing living hinges something exclusively for shops that do not know how to CNC a living hinge. If you are building a product that needs to be made out of a plastic material other than polypropylene (e.g. acrylic, polycarbonate, or acetal) you are likely to be better off considering a traditional hinge with multiple moving parts. What Are Some Examples of Living Hinges? 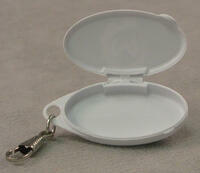 Consumer products are a really common place for you to see living hinges. Common examples include plastic bottles used to house food products like ketchup or hygiene products like shampoo and body wash.
1. Condiment Bottle Caps: The caps on your bottle of ketchup are an example of living hinges you use almost every week (perhaps every day depending on how many hamburgers and potatoes you eat). The two images shown below are a classic example of butterfly living hinges. 2. Personal Hygiene Bottle Caps: body wash, shampoo, and personal hygiene products are frequently packaged with living hinge caps. What Are The Performance Characteristics Of Living Hinges? 1. Aesthetics: Living hinges are extremely clean and easy on the eye due to the elegant nature of their contiguous and smooth curves. There is room for creative license and new design possibilities can always be explored. 2. Applicability: There is a wide range of uses for living hinges and a novel solution can be adapted for most injection molded prototypes that require the use of hinges. The simplicity of living hinge designs makes them perfect for such purposes. 3. Chemical Degradation: Because living hinges are made from plastic there is no possibility of rust as you would have with metal hinges. 4. Cost: Because they are made of a single part, living hinges are typically much cheaper to produce than other types of hinge mechanisms (many of which require labor to assemble, multiple tools to produce etc). The fact that the hinge is incorporated into the design and manufacturing process of the prototype makes the cost of living hinges markedly reduced. 5. Durability: Living hinges are extremely durable. The absence of an extensive number of parts makes them very sturdy and virtually unsusceptible to part wear or failure. Some living hinges are capable of millions of cycles before any sort of wear or tear materializes. Note: living hinge prototypes produced from 3D printing have significantly less ability to withstand frequent bending. This is because the available 3D printing materials are not equivalent in terms of material properties to polypropylene. 6. Flexibility: Living hinges have exceptional flexibility about the hinge’s designed axis of rotation. 7. Friction: Living hinges experience almost no friction at all as they are made out of a single part. This is a significant advantage over traditional hinges. 8. Lifespan: If manufactured correctly living hinges will last the entire lifespan of the part. They should be able to bend hundreds of thousands to millions of times without significant wear and tear manifesting itself. 9. Maintenance: Living hinges do not require maintenance or repair because they only fail when subjected to unnatural conditions. 10. Range of Motion: Living hinges are typically designed to provide 180 degrees of angular motion. Some are not designed to restrict bending to a particular limit at all and will rotate well beyond 180 degrees while other designs ensure that the hinge does not flex beyond a certain angle (e.g. 90 degrees). 11. Strength: Living hinges are very limited in their ability to bear loads (whether it be tensile or compressive stress or shear strain). This is one of the major limitations with living hinges. 12. Temperature: Plastics (what living hinges are made from) generally have low melting points. Therefore as temperature rises and approaches the glass transition temperature (the temperature at which it begins to transition from liquid to solid state) the material will become less and less rigid. Using Injection Molding: Creating a living hinge prototype using injection molding requires one to first Design and manufacturing an injection mold tool (a block of aluminum or steel with an internal cavity in the shape of your prototype part). Getting the hinge right in an injection mold tool can be tricky and it is much more expensive to design and build an injection mold tool than it is to cut one or two prototypes on the CNC machine. We recommend this method when you need several hundred to a thousand prototypes for things such as pre-production testing purposes. On such a scale it is much more efficient to injection mold the parts out of the final material than it would be to CNC cut so many of them. Additionally, for sale samples where fifty to one hundred prototypes are required, using injection molding is probably the better option, not only because of the quick turnaround, but also because the finish is better than a CNC cut prototype. This is vital in sale sampling where it is desirable that the prototype looks as close to the final product as possible. Note: even in such a case it is nice to first CNC cut prototypes to make sure the design is properly functional before making the investment in an injection mold tool. Living hinges are extremely useful in a wide range of applications. They are made from polypropylene plastic. Accordingly they last essentially forever. Their one major limitation is that they do not support heavy loads well. The best way to produce living hinges depends on the number desired. For small projects where 1-10 hinge prototypes are desired we strongly recommend CNC machining them from a block of polypropylene. For larger projects where 100-1000 prototypes are desired we recommend injection molding. When it comes to final production en masse the obvious solution is also injection molding. If you need help with any of the above solutions please contact Creative Mechanisms. Creative Mechanisms is a living hinge design and prototype development company. Living hinges are one of our specialties. We have unique expertise in this field and can help you get a working prototype and/or a production quality mold for your new part. If you are a serious company and would like to see a sample of our work please visit this page and submit a request.